Ryanair, Europe’s No 1 airline, today (10 Dec) revealed Christmas came early for customers onboard its flight from Dublin to Barcelona who were surprised with personalised Christmas gifts from its ‘Runway Retail’ inflight magazine, which features a range of exclusive gift ideas, including cosmetics and fragrances for men and women. 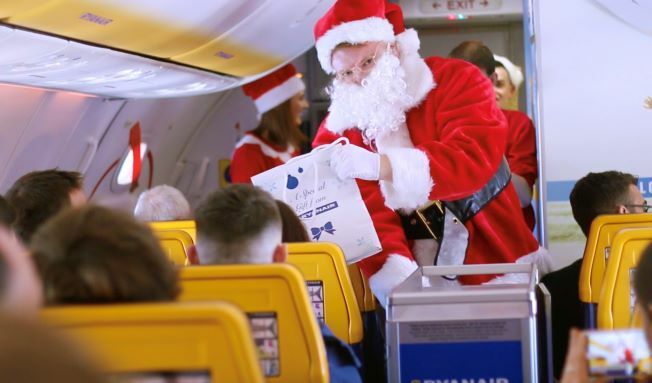 All Ryanair’s fragrance and beauty lines are up to 60% cheaper than the high street and to celebrate Christmas, Ryanair has slashed an additional 10% off all its fragrances* for the festive season, ensuring even more savings for its customers. Customers can now enjoy a dedicated inflight shopping section on the Ryanair website and app, where they can download ‘Runway Retail’ directly to their smart phone prior to their flight. “Christmas is nearly here so we wanted to spread some festive cheer and surprise customers on board this flight from Dublin to Barcelona with personalised Christmas gifts from our ‘Runway Retail’ inflight magazine, which features a range of exclusive gift ideas for men and women.